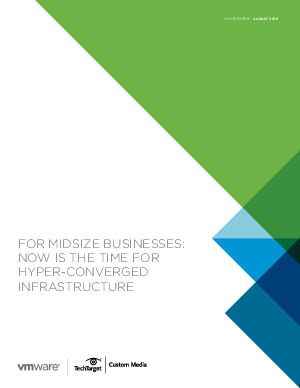 With nearly 20% of midmarket firms using Hyper Converged Infrastructure (HCI) and another 46% actively investigating and planning to adopt HCI solutions over the next 12-18 months, there has never been a more critical time to get ahead of your competition. Midsize businesses face the same need to modernize IT and embrace digital transformation as much as their larger competitors, but are typically restricted by resource and money. HCI enables midsize organizations to address these challenges with a solution that can grow as the business grows, without the financial burden or requiring to choose between on premise or public cloud solutions. The investments you make in IT technology and selecting the right HCI platform will impact your ability to evolve, grow and compete effectively in the future. Submit the form to read our latest whitepaper and discover how you can modernize IT and improve your midsize business operational efficiencies with vSAN.